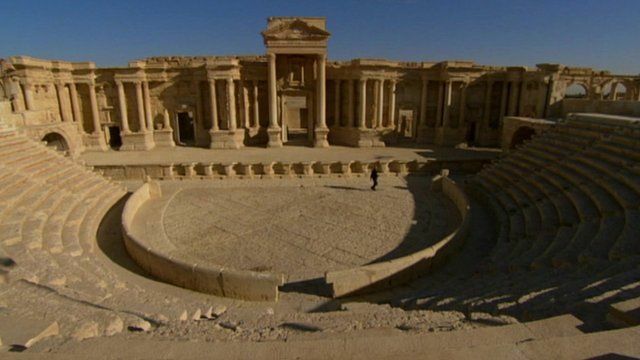 IS fighters near historic city Jump to media player Islamic State militants move to within a few miles of one of the world's oldest and most important archaeological cities, Palmyra, in the latest stage of their campaign in Syria. Islamic State deputy reported killed Jump to media player The second-in-command of the group calling itself Islamic State has been killed in a US-led coalition air strike in northern Iraq, the Iraqi ministry of defence says. Islamic State destroy Yazidi homes Jump to media player Islamic State militants begin destroying houses belonging to members of the Yazidi community in Iraq. IS 'training and supporting Taliban' Jump to media player The provincial governor of Kunduz says foreign jihadists trained by the Islamic State group are fighting alongside the Taliban for a "bigger, modern fight". Saving culture in a danger zone Jump to media player An international group of experts have gathered in the Netherlands to practice saving cultural artefacts in areas of conflict and natural disaster. 'Snipers everywhere' in Yarmouk camp Jump to media player BBC Arabic's Assaf Abboud visits the centre of the Yarmouk refugee camp in Damascus, Syria and finds its battered streets deserted and silent. Islamic State militants have moved to within a few miles of one of the world's oldest and most important archaeological cities, Palmyra, in the latest stage of their campaign in Syria. It is thought that key Syrian military bases are their primary targets but a UN cultural official has expressed alarm at the risk to a UNESCO World Heritage site in the area. The militants have a record of destroying what they describe as "idolatrous" sites in Iraq and Syria, filming their work as part of their propaganda videos. World affairs correspondent Richard Galpin reports.